Genuine shellac cement, reinforced with resins. SHELLAC/GASKET CEMENT seals the pores created in the seams of oil and water tanks, as well as threads and gaskets. 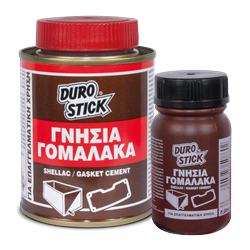 Suitable for coating wood knots, preventing the peeling and cracking of enamel paints and varnishes. The container cap has a built-in round brush for easy applications.